Professor Bruce Kemp, Head of SVI's Protein Chemistry and Metabolism Unit and one of Australia's most respected biochemists, has been honoured as an Officer of the Order of Australia. 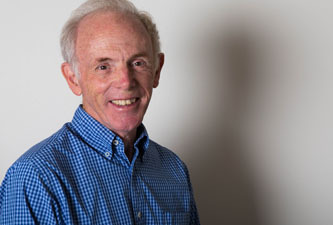 Professor Kemp was included in this year’s Australia Day Honours List for his distinguished service to biomedical research, particularly to the study of protein phosphorylation. The honour falls on the 30th anniversary of Bruce's arrival at the Institute. Bruce’s interest in kinases developed during his PhD studies at Flinders University in the 1970s. At the time, the field was nascent - although the first kinase had been identified in the 1950s, not much was known about how they worked. Bruce’s PhD project on kinases within immune cells called lymphocytes meant that he was one of the first people in the world to be working on the role that a specific kinase played within an individual cell. He describes himself as having been hooked from then – over almost half a century he has contributed much to our knowledge of the predominant role kinases play in nearly every aspect of cell biology. In the early 1990s, Bruce’s group was the first in the world to sequence a protein called 5' AMP-activated protein kinase (AMP kinase). AMP kinase is now known to orchestrate the cell’s energy levels. Like a conductor directing musicians to play faster or slower, louder or softer, AMP kinase can dampen processes that use energy when energy levels within the cell fall, and activate those that produce it to ensure that adequate energy is available to keep the cell working. This central role in cellular energy control implicates it in diseases as diverse as cancer, type 2 diabetes, heart disease and dementia. Bruce's laboratory is now focused on harnessing the power of AMP kinase to find ways to treat these diseases.